Wheaton College Graduate School knows their core audience both through research as well as through day-to-day interaction. The prospects most interested in their programs also are the exact type of students which the school desired to attract: college-graduate adults who have a passion to serve Christ. Design Corps was asked to produce ViewBooks, posters, advertisements for magazine, web banner advertisements for online, conference banners, and interactive CDs. To start with, for their overview booklet, we put the emphasis on dull gloss and natural colors to give their materials the rougher, earthier look of an adventure guide book. Backgrounds were parchment, graphs were hand-drawn, and quotes were in hand-written script. To further enhance this theme, symbols of navigation were used, like a sextant, a compass, and road-signs. 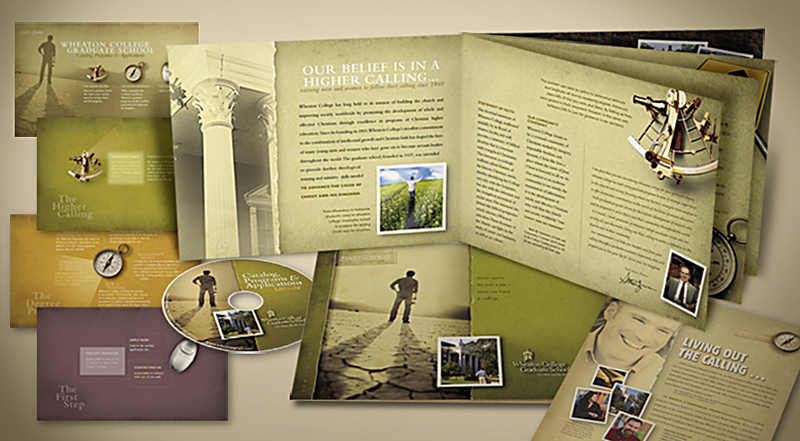 We also included more testimonials and inspirational quotes from God’s Word on the subject of following one’s calling. Finally, a CD was produced to be included in the guidebook or handed out at conferences. It carried over the style of the guide book and had extra pages using the symbolic tools guiding prospects to seek a higher calling, to choose a direction, and to download information to start the application process.